Applying fire safe concepts into your landscape is one of the most critical ways to help your home survive a wildfire. As conditions turn dry and windy, vegetation such as dry grasses, trees, and other vegetation surrounding your home can be a dangerous fuel source. Maintaining an area, which we call defensible space (an area of reduced fuel) between your home and potential fuel sources such as vegetation minimizes the risk of home ignition. When your home and landscape is appropriately maintained to fire safe standards, the threat to your home during a wildfire is reduced. Your home may be the most valuable investment you ever make. If you live in a high-risk fire hazard area, protect against the chance of losing that investment by implementing our fire safe recommendations. How do I know if I live in a High Risk Fire Area? In you live within Central County Fire Department jurisdiction, the high risk areas are primarily within the Town of Hillsborough. For a map of those areas, you can go to the map that has been adopted by the Town of Hillsborough. For privacy reasons would do not post specific addresses. If you want to know if you live in this area, please call our offices and ask for our Fire Prevention Division, 650-558-7600. 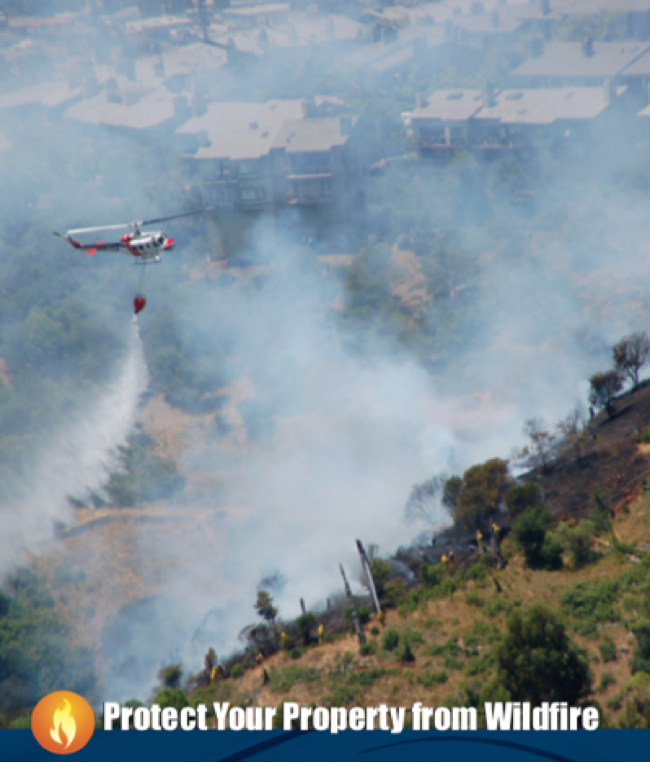 Defensible space is essential to improve your home’s chance of surviving a wildfire. It’s the buffer you create between a building on your property and the grass, trees, shrubs, or any wildland area that surround it. Defensible space is intended to slow or stop the spread of wildfire and protect your home from catching fire – either from direct flame contact or radiant heat. 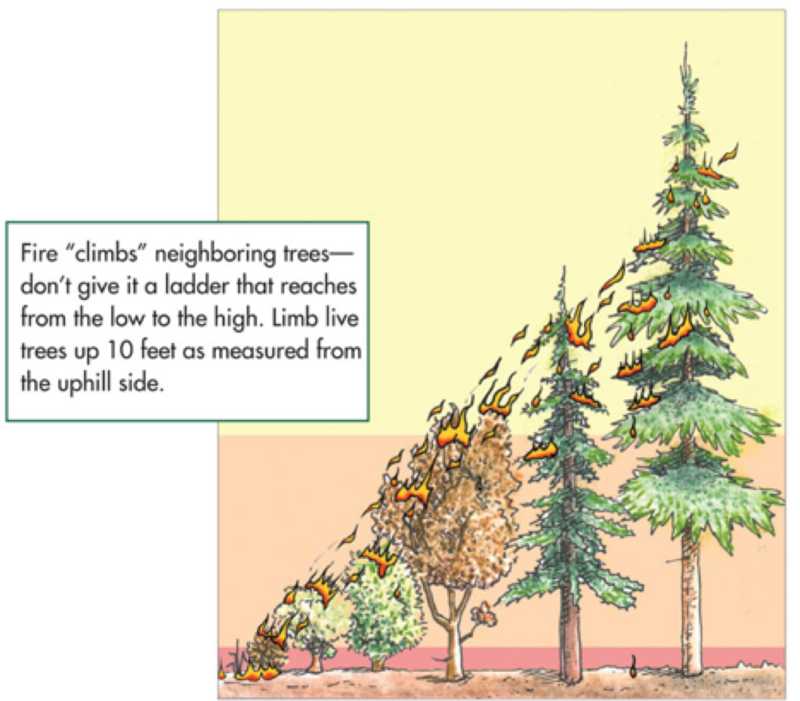 Understanding how fire spreads is the central concept behind defensible space. Often understood as a “fuel ladder” fire will spread vertically and horizontally where there is fuel available. The spacing between grass, shrubs, and trees is crucial to reduce the spread of wildfires. The spacing needed is determined by the type and size of brush and trees, as well as the slope of the land. For example, a property on a steep slope with larger vegetation requires greater spacing between trees and shrubs than a level property that has small, sparse vegetation. Creating an area of defensible space does not mean you need a ring of bare dirt around your home. Through proper planning, you can have both a beautiful landscape and a fire safe home. We hope our website helps you provide for a fire safe home. Click here to visit our WUI Resources page and you can always call us at 650.558.7600 and ask for our Fire Prevention Division to assist you.